The Farne Islands are a group of islands off the coast of Northumberland, England. There are between 15 and 20 islands depending on the state of the tide. They are scattered about 2.5–7.5 km (1½–4¾ miles) from the mainland, divided into two groups, the Inner Group and the Outer Group. The main islands in the Inner Group are Inner Farne, Knoxes Reef and the East and West Wideopens (all joined together on very low tides) and (somewhat separated) the Megstone; the main islands in the Outer Group are Staple Island, the Brownsman, North and South Wamses, Big Harcar and the Longstone. The two groups are separated by Staple Sound. 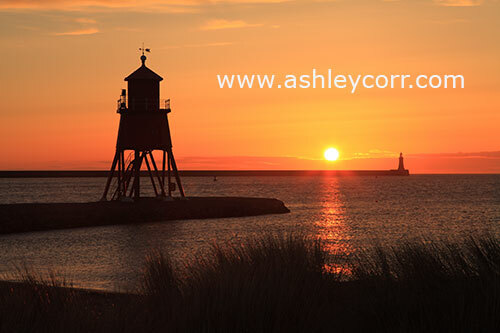 The highest point, on Inner Farne, is 19 metres (62 feet) above mean sea level. 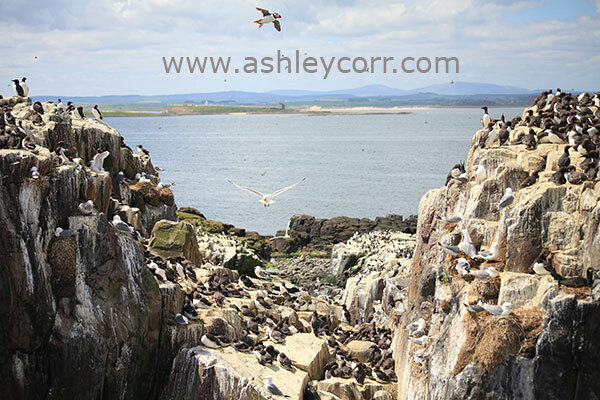 Every year, between the months of May and July, the Farne Islands is an impressive seabird city. Naturally, with excessive numbers of birds on the islands this place is very noisy and smelly during the breeding season, but that doesn't deter the average visitor from making the most of their experience. 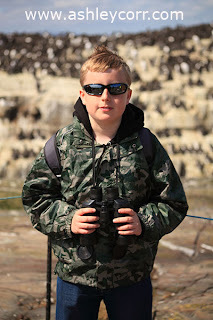 Today I travelled with my son Christopher, who'd been looking forward to this day for some time, given his big interest in bird life, which made my experience even better. We pre-booked our places on the boat trip, which was all day affair, so we needed to leave home at 7.30am in time to catch our boat which sailed out of Seahouses at 9.30am. Of course, we checked the weather forecast before booking the trip, so we knew we were in for much sunshine, which gave us something else to look forward to. Quite often the weather plays its part and occasionally the tour operator cancels sailings because of it, but no such drama today as it was sunshine and warm temperatures all the way. We arrived at Seahouses at 9am, giving us ample time to park up before making our way down to the harbour. We paid and collected our boarding cards then waited for our boat, which arrived bang on time. We were at the front of a large queue, so we had pick of the seats once we boarded. By the time everyone else had joined us the boat was crammed with around 45 people, plus the 2 man boat crew. And that was it, we were off and running. Our boat, Glad Tidings V, swiftly headed towards the islands. 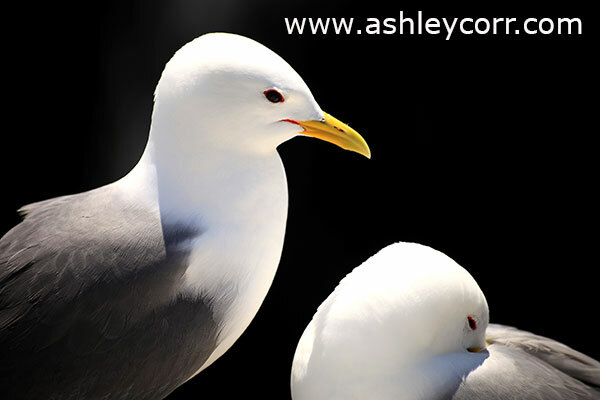 The all day boat trip is particularly suitable for the ornithologist/ photographer who wants to spend more time observing the wealth of nesting species. This trip only runs during the breeding season and lasts approximately six hours (two hours on Staple Island on the morning, and two hours on Inner Farne during the afternoon. 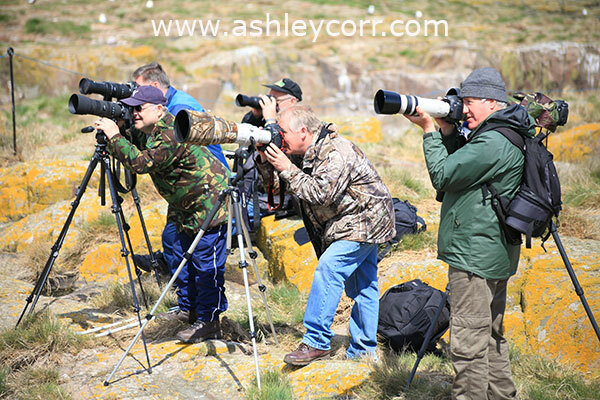 The other two hours includes a cruise around the islands to view the nesting birds on cliff faces and the Grey Seal colony at several vantage points. 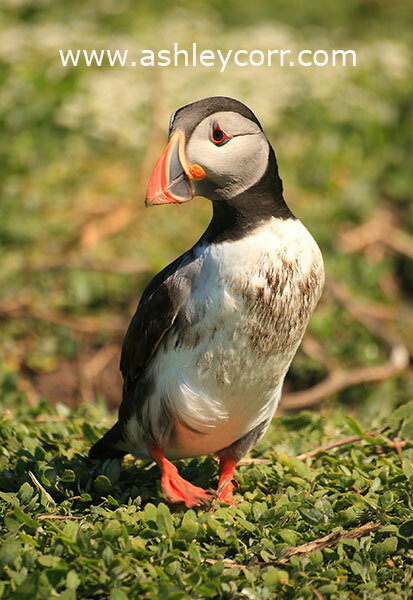 Inner Farne and Staple Island are major sanctuaries in the UK for approximately 22 species of breeding sea birds, including Guillemot, Razorbill, Eider Duck and 4 species of Terns, not forgetting the small detail of 70,000 puffins! Our first point of call was the cliff faces at Inner Farne. The boat engine was temporarily cut as we took in the sight and sounds of the nesting birds. The skipper commentary was interesting enough, although most people at this point were snapping away with their camera's and seemingly taking little interest in it. From Inner Farne we then headed out to Staple Island, through Staple Sound, then onward to Brownsman, Bluecaps and Longstone, the furthest point of the boat tour. After circling Longstone we were now heading towards Harcars, passing Grey Seal as we went, plus many species of birds which were flying low near the surface of the North Sea. Apparently a Minke Whale was spotted near the Farnes two weeks before, and although the skipper asked us to keep our eyes peeled for it, the animal didn't appear. We had been on the boat for an hour and our first landing was coming up shortly - Staple Island. 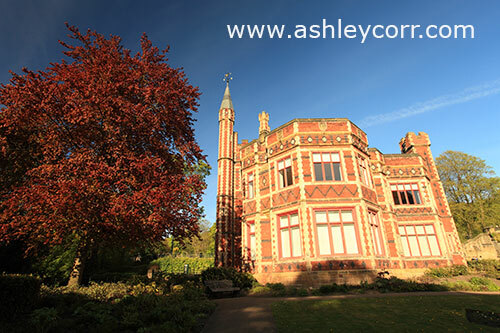 As this is a National Trust property a landing fee applies, which works out at £6.40 per adult and £3.20 per child. Obviously the same figures apply to the afternoon landing at Inner Farne, so the cost of your day out can work out quite expensive, unless of course you know someone who has a NT membership and he lets you borrow it for the day (wink). The sea was very calm today, so we had no problem getting off the boat and leaving our sea legs behind for a couple of hours. A queue formed as we stepped onto Staple Island, as most of the trippers weren't members of the National Trust. Those who were members were fast tracked past the queue before making their way up the entry path towards the action. In no time it seemed our two hour limit was up, so next thing we knew we were back on Glad Tidings and travelling around the remainder of the Farnes before our last landing on Inner Farne, which was scheduled as another 2 hours on land. By this time I was confident I had pulled in some decent shots, although my lens went hunting on more than ten occasions and had trouble locking on to subjects, even stationary birds. With that in mind I was expecting an uphill task when photographing birds in flight, but against the odds this is where I managed to pull in my best shots. We didn't see a great deal of eggs today, although Chris and his eagle eyes (binoculars) picked out a few here and there. He was loving the whole experience. As the breeding season was at an early stage we expected to see plenty of eggs, but the majority of parents were sitting, so that put paid to that prospect. It would be at least two weeks before chick were visible, but we had anticipated this before our journey, so we weren't gonna be disappointed on that particular score. Again, we passed a few Grey Seal en route to Inner Farne as they basked on the rocks. High tide isn't the best time to see them however, as low tide has many hundreds of basking seals on show around this time of year when they are also breeding. At 1.20pm we approached our second landing at Inner Farne. We tethered to the jetty before disembarking and were told in no uncertain terms that the 'Head Bangers' were waiting for us just a few metres ahead. 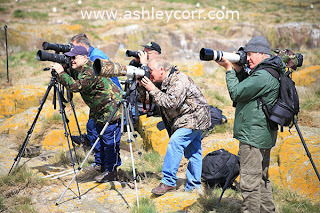 Enter the Arctic Terns, who were nesting in their hundreds along the path we were about to tread, and these customers don't take kindly to visitors who trespass their domain. We were well prepared for what lay ahead though, as I told Chris the tale of my last visit here, when an Indian boat tripper decided his turban was sufficient protection against the dive-bombing terns - WRONG !!!!! The poor fella seemed to be singled out by at least five angry as fcuk Terns, who in turn (no pun intended) took it upon themselves to drop shat over his dark head wear. Hey, this was hilarious to say the very least, that was until I got whitewashed myself down the left side of my laughing face. Needless to say I wasn't laughing anymore, especially as I was now providing laughter to all around me, whilst poor Abdul scurried off, seeking refuge in the nearby visitor centre. Welcome to Inner Farne!!! But that was then. Today there was just the usual pecking of the head and no whitewashing, not that we saw. At the top of that path lies the NT visitor Centre, and opposite is St Cuthbert's Chapel, originally built in 1370. All around this area is nesting Arctic Terns who are just as hostile as the others, with eggs on display. On my website slideshow there is one shot which shows a Tern heading straight towards my camera with a look of anger in its eyes (Link at bottom of blog entry). We expected to see dozens of Eider Duck nesting on Inner Farne, as is usually the case in May, but numbers were down and we only saw three or four sitting females. Next to Inner Lighthouse there were many nesting birds on the cliff faces, including Shag & Kittiwake, plus the Guillemots across the way on Pinnacle Rock. It was the amount of Puffin burrows that caught the eye too, with literally thousands of them everywhere we walked. I dropped anchor near the path an waited for Puffin's to appear, which they did, any they were anything but shy, as my photo's prove. Puffin's are peoples favourite bird of the Farne Islands, or so it seems. The 'Clowns of the Atlantic' are certainly photogenic, make no mistake about that. In the visitor Centre there is a newly installed 'Puffin Kam', where visitors have the chance to see one incubating it's egg in a burrow. I saw a video clip of it laying its egg, apparently the first time it has ever been filmed. 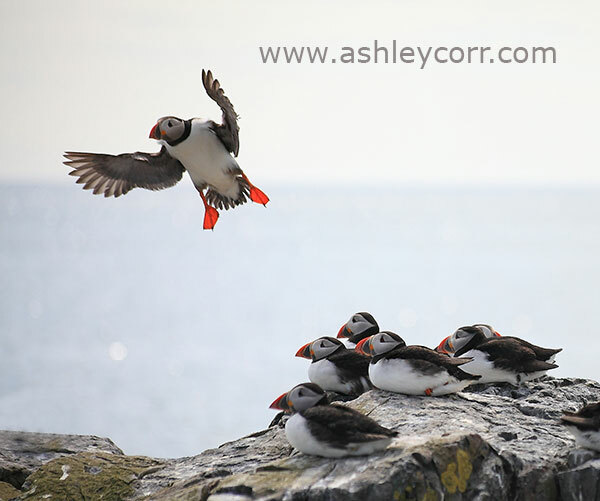 Photographing Puffin's in flight is one of the hardest tasks I've done with a camera, as these birds are quick. I managed to shoot one or two with a quick shutter and I was chuffed with the results - one is shown here, of an incoming bird above a small colony of 'Friends' on the cliff edge. Before long we were back on the boat and making our way back to Seahouses Harbour. Everyone aboard seemed to have enjoyed their day out - I know we certainly did, and it was worth every penny. Chris reminded me that I promised him Fish & Chips when we were back on the mainland - he doesn't forget stuff like that, he he. And by this time we were ready for a meal. The sun was still shining brightly as we disembarked, so off we went, up the ramp and into the restaurant. A nice way to end the day. I'd recommend this trip to anyone who shares an interest in this type of thing, so if you do, then check out the links below for more details. And that is all for now. I'll be beck again soon with more ramblings and the usual photograph accompaniment, so until then I shall tootle off and return at a later date. Hope you enjoyed your read! Not much time to spare today so I'll be swift this one. 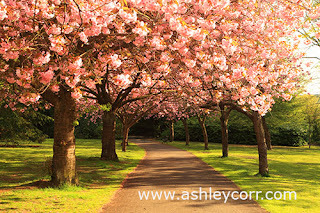 A recent, and first time visit to Saltwell Park in Gateshead presented a an opportunity to grab a nice photo or two of Cherry Blossom in full bloom - always an eye-catching site. You see plenty of this stuff during the month of May and early June, before it falls to the floor, creating a bit of a mess, it has to be said. This time was different though, as a pathway through Saltwell Park was flanked with trees in fine colour, offering me the chance to grab a shot at its very best. 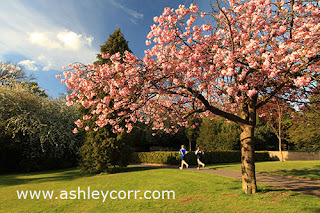 My favourite shot is the first one, with the couple walking hand-in-hand along the path. Other people stopped to take photo's, either on mobile phones or digital camera's, and I captured one such person here, although his hair style almost stole the show entirely - what do you think? 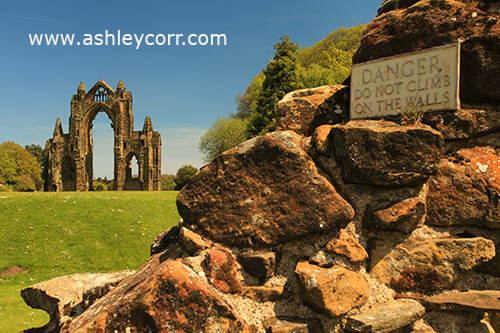 Gisborough Priory is a ruined Augustinian priory in Guisborough, the borough of Redcar and Cleveland and ceremonial county of North Yorkshire, England. It was founded in 1119 as the Priory of St Mary by Robert de Brus, 1st Lord of Annandale, an ancestor of the Scottish king, Robert the Bruce. It became one of the richest monastic foundations in England with grants from the crown and bequests from de Brus, other nobles and gentry and local people of more modest means. Much of the Romanesque Norman priory was destroyed in a fire in 1289. It was rebuilt in the Gothic style on a grander scale over the following century. Its remains are regarded as among the finest surviving examples of early Gothic architecture in England. 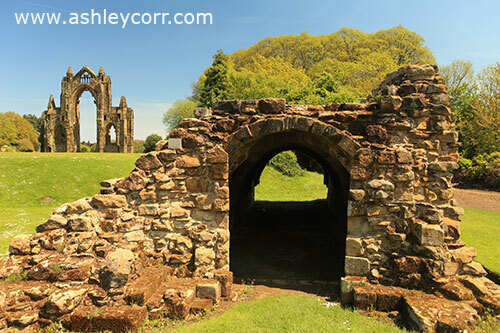 The priory prospered until the Dissolution of the Monasteries in 1540, when it was abolished along with England's other monastic communities. 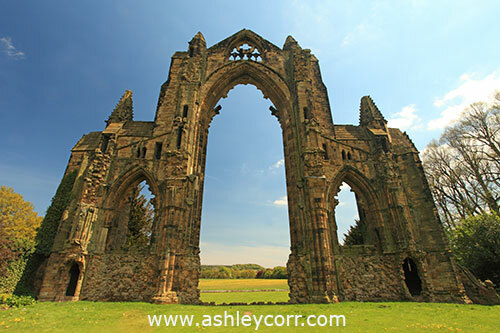 The priory buildings were demolished and the stone re-used in other buildings in Guisborough. The east end of the priory church was left standing with its great window forming a distinctive arch, a well-known landmark used as a symbol for Guisborough. It became part of the estate of the Chaloner family, who acquired it in 1550. The east window was preserved by them as part of a Romantic vista adjoining their seat, Gisborough Hall, from which the priory takes its idiosyncratically spelled name. It is owned by the Chaloners but is in the care of English Heritage as a scheduled monument. 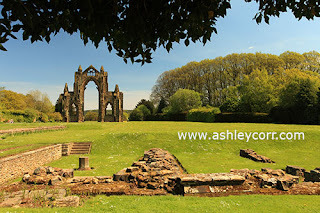 Since the 19th century archaeological excavations have taken place in the priory grounds, though a substantial part of the site has not yet been investigated. In addition to the east window, surviving visible fragments of the complex include the lower courses of the west range, a vaulted undercroft, a gateway and a 14th-century dovecote still in use today. 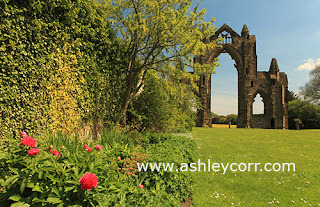 The adjoining Priory Gardens, laid out by the Chaloners in the 18th century, are under restoration by a volunteer group. The priory ruins and gardens are open to the public throughout the year. Parting with two of my hard earned quids, I entered the priory grounds after parking at a very handy spot directly in front of the main gate. There were one or two other visitors on site, which was good for me and the camera - don't want too many people inviting themselves into the frame, do we? The bright sun was across to my right, hitting the side of the priory ruins, leaving the main wall in shade, which wasn't ideal, but after twenty minutes or so it had travelled enough to cast its rays onto the stonework, bathing it and bringing out the colour that I was waiting to see. Time to start some photography. Pigeons flew in and out of crevices every few minutes, which was a tad distracting. They were making regular visits to feed their chicks which were sheltered in shade - an ideal place to build a nest. 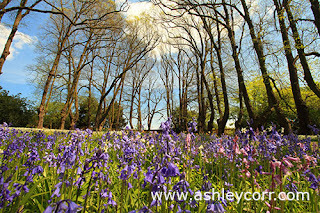 The grounds were very well maintained, although there wasn't a great deal of colour on show as far as flowers and plants were concerned, but I did manage to include what there was on offer, just to add that odd burst of colour to my shots. 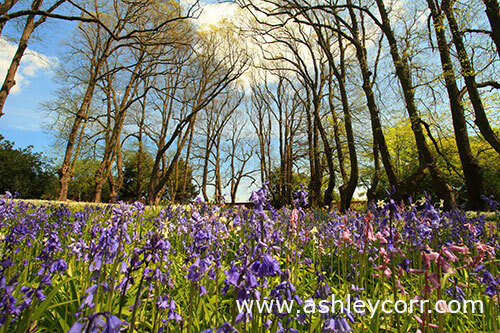 It was in the nearby wooded area that an abundance of colour was visible, in the form of a bluebell plot. quite photogenic, it has to be said. 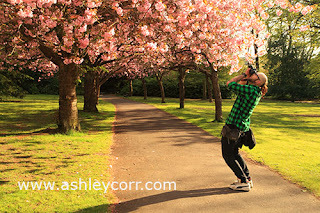 I got down low and took a few photo's, one of which is shown below. A rarity from me - a summer sunrise photograph by Ashley Corr. This has to be the earliest time of day that I've gone out with the camera, of that I'm certain. Winter time is when I regularly shoot sunrises, due to the fact that there's no need to get out of bed during silly hours, which can't be a good thing. So, what made me shoot a Summer sunrise at 5.00am, you may be asking yourself. Well, I'd slept for a few hours during the day, followed by a few more hours at night, then awoke at 4.00am and couldn't get back to sleep. That was it - up and out with the camera. I drove down to Roker Beach, expecting the sun to rise behind the pier, as it usually does, but that is during the Winter months and today was very different. 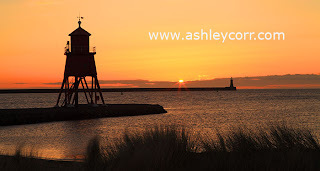 The early morning colour on the horizon gave a clear indication as to where the sun was about to rise, and it was nowhere near Roker Pier, but this is Summer, so the sun was about to rise further North, up the coast. With little time to spare before sunrise, I made the short journey to Littlehaven Beach, South Shields, where the sun was ready to rise over Tynemouth. 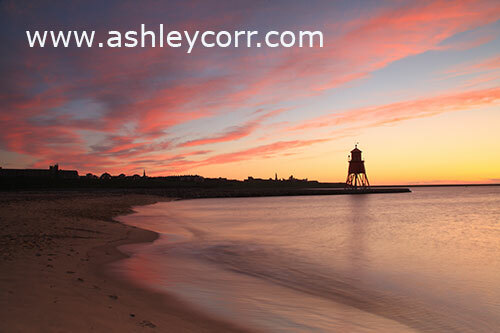 I took up position in the sand dunes at Littlehaven and waited for some colour in the sky. It wasn't long before that happened. There wasn't a soul around, which was perfectly understandable. Only idiots get out of bed to photograph a sunrise at 5.00am!! 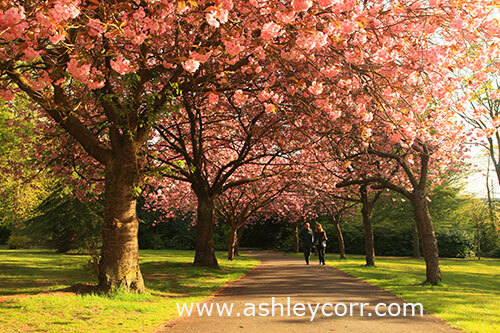 Here are three photographs. The first was taken shortly before sunrise. The second one shows the sun peeping over the low cloud cover, shortly after sunrise. The final shot, which is my favourite of the three, shows the sun over the cloud, as it shoots a ray of orange across the North Sea towards the dunes. Hey, maybe I'm not such an idiot after all. These shots were worth getting out of bed for, but somehow I don't think I'll be making a habit of it until Winter arrives once again.